If you serve this meal to dedicated liver or offal hater they will lick their chops not knowing what they just ate, it is that good. After all prep is done it takes just minutes to cook and serve. 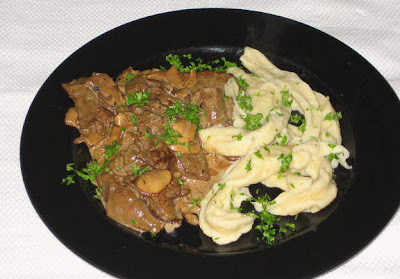 I highly recommend to cook Spaetzle or pasta ahead of time, just before starting to fry liver. Spaetzle can be reheated by tossing them in butter when you are reducing wine in the sauce. This is not lean cuisine by any stretch of imagination but once in a while I don't think it will hurt. It is rich and it is very, very good. To make it even more luxurious, just before serving I put in few drops of truffle oil. The aroma just made it very special. Note: You can substitute thin slices of pork tenderloin in place of liver. The cooking method is exactly the same. Preheat a bowl and keep at hand. Dry liver strips with paper towel and then toss with 1 Tbs. of oil. Cook spaetzle, toss with butter and keep warm. Heat up stainless steel skillet and when hot add 1 Tbs. of oil. When very hot drop in liver strips in one layer and brown for about 30 seconds and then turn all strips on other side and cook another 30 seconds. With slotted spoon remove liver to preheated bowl, sprinkle generously with salt, toss and keep warm. Discard all oil from skillet, put back on medium high heat and add 1/2 Tbs. of oil. Drop in shallots and mushrooms together with caraway seeds and white pepper and sauté while scraping fond from bottom of skillet. When mushrooms are soft and shallots are translucent increase heat to high, pour in the wine and reduce wine to approximately 1/4 cup. Pour in cream, stir and reduce till sauce is thick and looks velvety. Return liver strips together with accumulated juices to skillet, sprinkle with freshly ground nutmeg and stir till liver is reheated and coated with sauce. Serve on individual plates with spaetzle and garnished with chopped parsley.